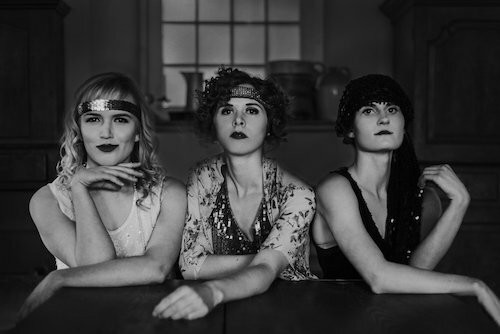 Hogtown: The Immersive Experience (The Hogtown Collective), now playing at Toronto’s historic Campbell House, embraces the concept of participatory choose-your-own-adventure theatre that has been so popular with audiences in such shows as Sleep No More. It’s a site-specific formula that works extraordinarily well: give the audience a set-up, and then let them roam around as stories unfold simultaneously, following whichever characters intrigue them. Hogtown delivers this intrigue in spades. In this set-up, Toronto in 1926 is in the throes of the Temperance movement and on the cusp of a mayoral election. The candidates include the incumbent Thomas Foster (Jerome Bourgault), an establishment conservative with an anti-booze platform, and the more liberal Sam McBride (Mark Prince), friend to unions and regulated alcohol sales alike. The advance polls open that night, and that means last-minute political shenanigans and scandals are about to go down, especially because the two men, their families, and their shadiest and best-connected supporters are all in the same spot. Things are narrated and gently shepherded by reporter Ben Stein (Gord Gammie), who is torn between his loyalties to his paper, the truth, and McBride’s daughter. Most importantly, there’s a hopping speakeasy in the basement, where, despite the occasional interruption and drink-shaming, patrons are always shown a good time. There’s a plethora of characters (though it might have been nice to see a little more diversity) and far too much story to relate; suffice it to say that watching it unspool is a ton of fun. It’s like being at a great party where you’re encouraged to eavesdrop on any conversation you want, but also has a few serious points up its sleeve about the complexity of social problems, women’s rights, and the uneasy notion that some things haven’t changed much in 90 years. The opulent, stentorian house is a perfect foil for the story, and effectively contrasts with the added décor, much of which has an oddly pop-art feel (such as neon spraypaint). There’s no anachronism in the lovely costumes, on the other hand, which are beautifully period-appropriate. The 23-person cast is uniformly excellent, committed and clear, whether they are playing to a full room or to one person. Everyone’s nuanced backstory has clearly been carefully considered. I hesitate to single anyone out, but was impressed by the intensity of Andrea Irwin’s temperance league member, Pauline Drabble, who was moved to a more violent means of protest. As well, Claire Frances Muir’s no-nonsense and quietly moving Libby Prowse, “Canada’s first female doctor” and her scenes with Maddie (Karen Slater), the golden-voiced mayor’s daughter, were extremely compelling. Arinea Hermans and Laura Larson give us the gleeful exuberance and irreverence of two teens looking for a good time, and all members of both mayoral families lend their rivalry a tense edge. Not only is the acting top-notch, but the singing is spectacular. The play is filled with mostly period-appropriate song (okay, Showboat premiered in 1927, but who’s counting), both solo showcase numbers and glorious ensemble a cappella pieces, all of which I loved. Because this is your adventure, you get out of Hogtown what you put into it. Don’t exhibit traditional Torontonian reserve; if an actor reaches out a hand, take that hand and dance. Make eye contact. Indulge in some moonshine. But most importantly, just go. It’s an experience you’re not likely to forget. Hogtown: The Immersive Experience plays at Campbell House (160 Queen St. West) until Sunday August 20, 2017. The show requires standing, walking, and climbing stairs. Venue is not accessible. This show features adult subject matter and is not suitable for children.